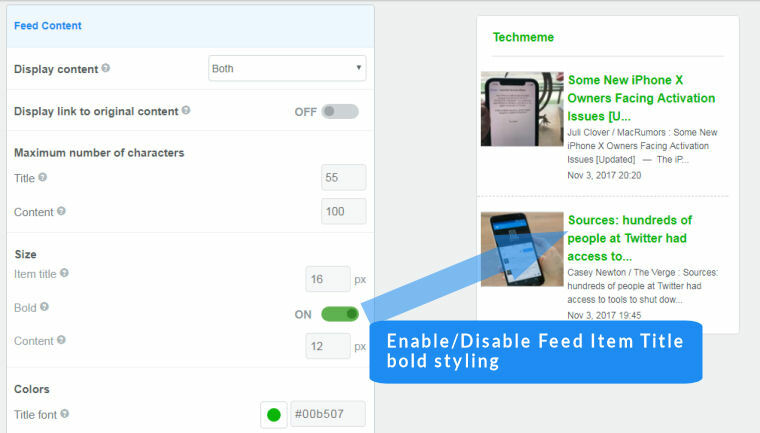 Introducing a new feature to allow you to make titles bold in your FeedWind widgets. You can now make titles bold so they more visible to your users and/or match your website styling. It was already possible to bold titles by using a custom CSS but we thought it would be useful to many of our users to have simple On/Off functionality in the setup screen. You can find out how to style fonts in our tutorial which has information about this new feature and other information about font styling. You can check out the new feature now by logging into your account and checking out the updated setup screen. This is found in the Feed Title section > Advanced settings. This is found in the Feed Content section > Advanced settings. If you need any assistance to make titles bold or any other aspect of FeedWind, please contact us contact us and we’ll be happy to help out!